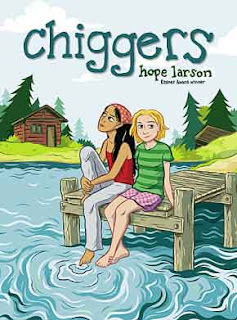 CHIGGERS is a fun graphic novel written by Eisner Award Winner Hope Larson. CHIGGERS is an interesting and enjoyable story about a adolescent girl named Abby who is going through what all young people go through: friendship and identity issues. The title itself comes from an inside joke that the campers circulate around the camp. “They’re, like, these little, tiny bugs that crawl under your skin and die, and they itch a lot. Way worse than mosquito bites” (p.24). The graphic novel revolves around Abby and her return to summer camp. Abby being very young and a bit of a naive adolescent is returning to her what seems to be yearly summer home where she expects to see all her old friends and start from where they left off, but things did not turn out exactly how she wanted them to. Being the first person to be dropped off at camp, Abby anxiously waits for everyone to arrive and for her fun to start as soon as her old friends arrive, but Abby's excitement quickly ends. Rose is the old friend who Abby especially cannot wait to see, but from the first encounter between the two, Abby quickly realizes that things at camp are going to be a lot different this year. This year her friend Rose is a Cabin Assistant and a bit too busy to really get to talk to Abby, let alone spend time with her. All of Abby’s other friends from last camp also seem to be different. One has piercings, others have boyfriends, or some just think that they are too mature and cool for Abby. The only person who seems to be the only one who does not think that she is too cool for Abby is a young girl named Shasta who was new to the camp and had been struck by lightning. In CHIGGERS it seemed like Abby would do anything to try to fit in with her old “friends.” Abby often did things that we as readers could see were not characteristic of her such as treating Shasta horribly and taking insults from them. Eventually Abby finally realizes that all she has to do to be happy is be herself. Although this book seems to be very realistic, we as readers are also introduced to supernatural occurrences. One thing made me think about this is when Abby and Teal run off together we get a visual of them being elves and another is when they develop wings like fairies. In a discussion in class we talked about the magical realism of the novel. The fantasy world is just like a reflection of what their camp is; it is only real for that particular time and it will only last till the end of the summer. As mentioned above it is a really fun story to read especially for younger girls in middle school or even the early high school. It follows the format of the movie Mean Girls. It is not the most educational story that one can find, but I believe that it is a great book to have in the classroom. I think all kids will be able to relate to this book mainly because everyone goes through the types of changes that Abby is going through. One lesson that I feel that could be taught using the graphic novel CHIGGERS is a lesson that deals with identity. Abby seems to be struggling to find out who she is or who she wants to be and at the middle school and early high school ages many students are dealing with the same thing; therefore, creating a lesson dealing with something that relates to them will definitely have them engaged. I like how more and more graphic novels are moving into the terrain for young girls, and taking back some of the ground of comics for boys. I have seen this one, but have not yet read it. It sounds like it might be a good complimentary text, but not necessarily a primary text.